I had to do a Queen music video eventually, so why not do one of my all-time favorites from one of my all-time favorite movies. Plus, I think that Clancy Brown as The Kurgan is scary enough for October. I’ve tried to pick out music videos that fit with the month somehow if I could. Going in to watching this music video, I figured it would just be Queen performing with cutaways to footage from the movie. I wasn’t too far off, but they actually bothered to do more than that. We get to see them performing on the set of one of the final battles that took place on the Silvercup rooftop stage at Elstree Studios, London. We also see Brian May play guitar as the castle from the film collapses. But more than that, we actually get to see Christoper Lambert clash swords with Freddie Mercury at almost exactly the two minute mark. Do you need more of a reason to take four minutes out of your day to watch it just to see that? That’s really it. All the sources I find say that Russell Mulcahy not only directed the film, but also the music video on February 14th, 1986. I couldn’t find any other credits. I wish there was more to say, but it’s a simple music video for a great song. Enjoy! Ghost Rider has always been a niche character for Marvel Comics. The character was born out of an earlier Marvel character named Night Rider. After Marvel writers Roy Thomas and Gary Friedrich and artist Mike Ploog had rein-visioned the character into Ghost Rider during the early 70’s it has always remained on the extreme fringes of the Marvel Comics universe. This wouldn’t stop Sony (which owned the film rights to the character) to go ahead and adapt it for the big-screen. 2007’s Ghost Rider by Mark Johnson was the first and failed attempt to turn the character into a film franchise. It still made enough money despite a near-universal panning of the film by critics and audiences alike. This turn of profit is why Sony once again dipped into the Ghost Rider well and come up with 2012’s Ghost Rider: Spirit of Vengeance. This “sort of” sequel ditches Mark Johnson and brings in the dynamic (and I’d say somewhat insane) directing duo of Mark Neveldine and Brian Taylor to helm the film. It brings back Nicolas Cage for the role of Johnny Blaze/Ghost Rider. Working from a script by Scott Gimple, Seth Hoffman and David S. Goyer one would think the film had nowhere else to go but up especially with the wacky and frenetic filming style by Neveldine/Taylor. To say that this sequel failed to do anything but finally give this film franchise a final nail in it coffin would be an understatement. Ghost Rider: Spirit of Vengeance ditches pretty much most of what transpired with the first film and tries to retcon things for the sequel. I’d say this would’ve been a good idea seeing the first film was truly awful, but what the sequel ended up doing was confuse things even more. 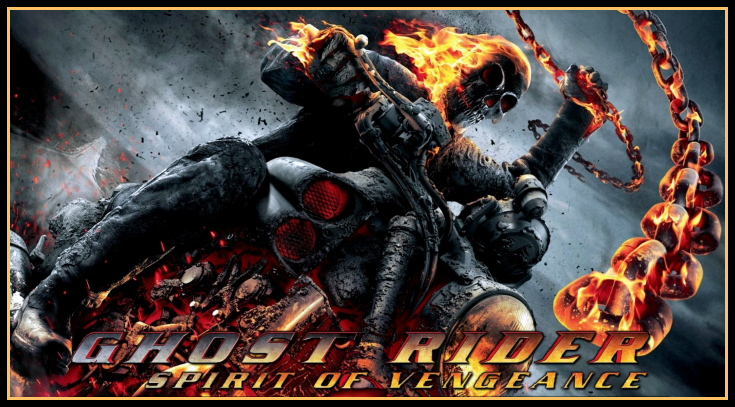 The film tries to turn the Ghost Rider persona from just a spirit of vengeance but an angelic being called the spirit of justice which had become corrupted. We get the Devil in the form of Roarke (played by Irish actor Ciaran Hinds) searching for the young boy Danny who is to be his perfect vessel. Johnny Blaze comes into the picture after being recruited by a drunk French warrior-monk by the name of Moreau (Idris Elba whose performance was one of the lone highlights of the film) who promises to exorcise the demon from Blaze in exchange for finding and saving Danny. This would’ve been a good premise if it had several more drafts of it worked on. Though there’s still a chance the film would’ve still sucked in the end. Even the direction from Neveldine/Taylor (Crank, Crank: High Voltage, Gamer) failed to add any heat to the proceedings. They come up with some unique camera angles and action sequences, but gone was the hyper-realistic and frenetic style they’ve become known for. Their previous films were not stuff to write to one’s film critic circles about but they at least had a sense of fun built into them even if their stories defied any sort of logic. Even the performances by the cast seemed to be something that barely reached the level of one-dimensional. Nicolas Cage tries to channel his inner crazy by way of Bad Lieutenant: Port of Call New Orleans, but it’s too little too late to save the film which never found any sort of footing on the side of competent. Really, the only good thing worth of note was my previous mention of Idris Elba as Moreau who chews the scenery every time he shows up on the screen like it was his last meal. This performance alone wasn’t enough to save the film or even make it somewhat entertaining. Ghost Rider: Spirit of Vengeance was not worth seeing in the theater (especially in 3D though that part of the film was actually quite well done despite being a post conversion) and I’d be willing to admit that it’s still not worth seeing on video unless it was for free. What could’ve been a restart to the series with the inclusion of Neveldine/Taylor instead gives this franchise it’s death-knell and most likely help Marvel get the rights back from Sony. Here’s to hoping that the flaming skull rider stays on the fringes of the Marvel Cinematic Universe for decades to come. Ok, the first Ghost Rider wasn’t what one would call something great or even good. I’d say that in the scheme of how we judge films that one was quite awful. Yet, it also had a certain charm which made watching it on cable. Maybe not paying to see it makes it more enjoyable in a “guilty pleasure” sort of way. The fact that 2007’s Ghost Rider actually made a profit is why we have this sequel now set to come out in a couple months. Ghost Rider: Spirit of Vengeance was suppose to be a sequel, but people involved in the project say it’s a sort of retooling/reboot. Whatever they need to do to make themselves justify this second film is ok by me as long as it’s entertaining in the end. From looking at the trailer, Ghost Rider: Spirit of Vengeance has less of the camp of the previous film and is all about action. Some of the action scenes look to be ludicrous, but cool looking and having directing-duo Neveldine/Taylor of Crank series and Gamer controlling the project means be prepared for even more over-the-top action. If this film can be entertaining in a grindhouse way despite it’s flaws (like another early year film of Cage’s in 2011, Drive Angry) then I’d say making this second film would’ve been worth the price of admission (at least a matinee-ticket).